I can’t tell you how many times I’ve chucked the intro for today’s post. What’s worth saying? What words are going to be of actual benefit to you, the reader, and what words are just vacuous self-indulgence? Why even bother? I don’t know. Due to logistical necessities, we are back in the God’s Little Deconstruction Book series, and there’s nothing to do but move forward. Or not. We could not. But it looks like we’re going to say some words anyway, even if it turns out to be a mistake. And wouldn’t you know it, today’s verse is about wasting your breath on words: “In all labor there is profit, but mere talk leads only to poverty” (Proverbs 14:23). Are you trying to tell me to shut the computer down right now and go do something, God? Having worked on so many things that weren’t profitable, it seems patently false to me that there is profit in all labor, but here is Solomon apparently disagreeing with me. It’s time to figure out what he actually means. And you know what that means? That’s right, fam, it’s Strong’s Concordance time. The Hebrew word translated as “labor” here is one we haven’t examined before. It’s עֵצֶב, ‘etseb, and you know what it means? Hurt. Pain. Toil. It’s like if your soul is getting pushed, strained against, feeling the pressure like a pot on the wheel. Have you ever tried throwing a pot and felt like the clay was fighting against you? ‘Etseb comes from the verb עָצַב, atsab, which can mean “to hurt” or “to fashion, stretch into shape.” And I’m playing Amateur Biblical Hebrew Scholar here, but I can’t help thinking that when you’re out in the fields straining the break up the soil, or unloading a truckload of fifty-pound FedEx packages, or trying to wrest some meaning from these words on your laptop, grappling with yourself, that’s ‘etseb. It hurts because you’re being shaped by the Potter. And it takes faith to believe that in all labor there is profit, that in all toil there is gain. It takes trust that the Potter knows what he’s doing and has your best interests in mind. What if the Potter is making “vessels of wrath prepared for destruction?” (Romans 9:22). And what if you’re one of those vessels? I’ve got no easy answers here. But I did get a post out. And I don’t know, but maybe I wouldn’t have done it if I didn’t think the struggle would be worth it. And maybe that’s faith. On a chocolate-related note (remember when we did chocolate-related notes? ), given that I have been eating Green & Black’s milk chocolate with almonds for weeks on end, it would be easy to fall prey to the misconception that I love this chocolate with a passion unmatched. Not true, dear reader! 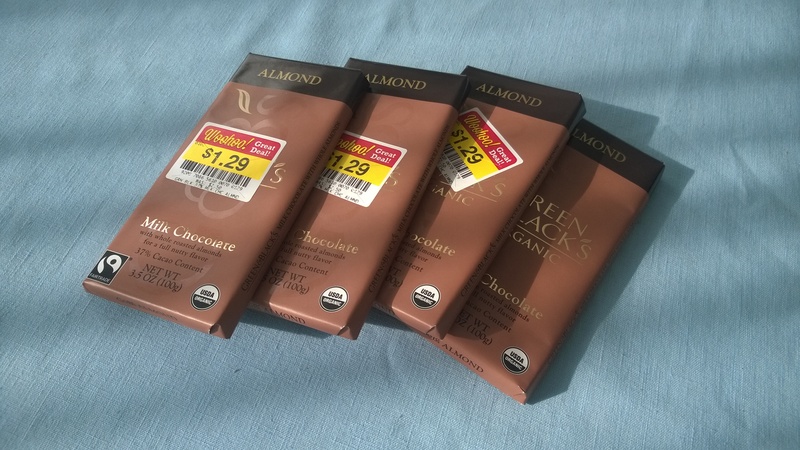 Make no mistake, I like this chocolate, but what I love with a passion unmatched is getting four bars of any fair trade chocolate on sale for a buck twenty-nine apiece. Buckle up, boys and girls, ’cause we’ve got a bar and a half of this stuff to go. Posted in God's Little Deconstruction Book, Old Testament, Proverbs, Romans, Topical Studies.Tagged bible, christianity, devotional, existentialism, faith, God, Proverbs, skeptic, suffering, theodicy, work.